Citation Information: J Clin Invest. 2018;128(12):5335-5350. https://doi.org/10.1172/JCI63562. Obesity is a major risk factor for developing nonalcoholic fatty liver disease (NAFLD). NAFLD is the most common form of chronic liver disease and is closely associated with insulin resistance, ultimately leading to cirrhosis and hepatocellular carcinoma. However, knowledge of the intracellular regulators of obesity-linked fatty liver disease remains incomplete. Here we showed that hepatic Rho-kinase 1 (ROCK1) drives obesity-induced steatosis in mice through stimulation of de novo lipogenesis. Mice lacking ROCK1 in the liver were resistant to diet-induced obesity owing to increased energy expenditure and thermogenic gene expression. Constitutive expression of hepatic ROCK1 was sufficient to promote adiposity, insulin resistance, and hepatic lipid accumulation in mice fed a high-fat diet. 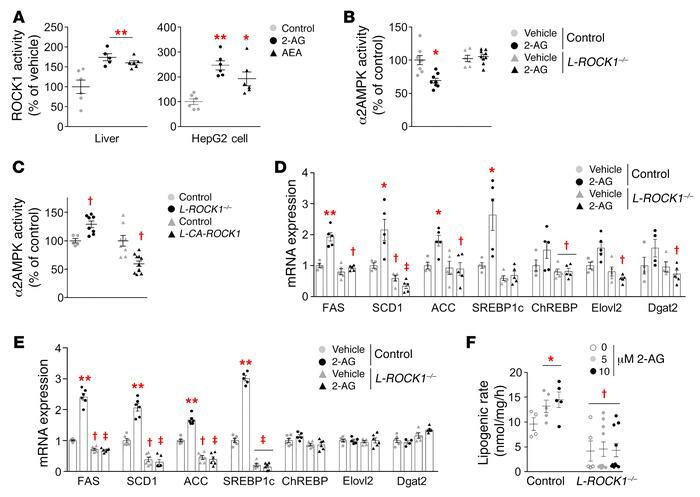 Correspondingly, liver-specific ROCK1 deletion prevented the development of severe hepatic steatosis and reduced hyperglycemia in obese diabetic (ob/ob) mice. Of pathophysiological significance, hepatic ROCK1 was markedly upregulated in humans with fatty liver disease and correlated with risk factors clustering around NAFLD and insulin resistance. Mechanistically, we found that hepatic ROCK1 suppresses AMPK activity and a ROCK1/AMPK pathway is necessary to mediate cannabinoid-induced lipogenesis in the liver. Furthermore, treatment with metformin, the most widely used antidiabetes drug, reduced hepatic lipid accumulation by inactivating ROCK1, resulting in activation of AMPK downstream signaling. Taken together, our findings establish a ROCK1/AMPK signaling axis that regulates de novo lipogenesis, providing a unique target for treating obesity-related metabolic disorders such as NAFLD. Endocannabinoid-induced lipogenesis is mediated via a ROCK1→AMPK signaling axis. (A) Endocannabinoid-induced ROCK1 activity was measured in the liver of C57BL/6 mice at 10 weeks of age and in HepG2 cells (n = 5−6 per group). (B) 2-AG–stimulated hepatic AMPK activity was measured in overnight-fasted ROCK1loxP/loxP (control) and albumin-Cre;ROCK1loxP/loxP (L-ROCK1–/–) mice fed a normal chow diet at 10 weeks of age (n = 6−9 per group). (C) Hepatic AMPK activity was measured in overnight-fasted L-ROCK1–/– and L-CA-ROCK1 mice fed an HFD at 18 weeks of age. ROCK1 and AMPK activity were measured by immune complex assay (n = 5−11 per group). (D) 2-AG–stimulated lipogenic gene expression was measured in control and L-ROCK1–/– mice fed a normal chow diet at 10 weeks of age. Mice were injected i.p. with 2-AG and sacrificed 4 hours later (n = 4−6 per group). (E and F) 2-AG–induced lipogenic gene expression (E) and 2-AG–induced lipogenic rate (F) were measured in isolated primary hepatocytes from control and L-ROCK1–/– mice fed a normal chow diet at 8 weeks of age (n = 4−10 per group). Isolated primary hepatocytes were treated with 2-AG for 6 hours and harvested for mRNA extraction. Gene expression was measured by quantitative PCR. Values are means ± SEM. *P < 0.05, **P < 0.01 vs. vehicle, †P < 0.05, ‡P < 0.01 vs. control by ANOVA with Fisher’s PLSD.